A photographic journey through Scotland's mountainous regions from the Paps of Jura to Sutherland. 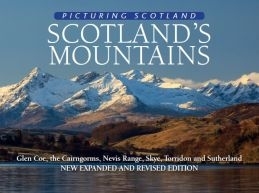 The photographs get to the heart of the great ranges such as the Arrochar Alps, Highland Perthshire, Glen Coe, the Cairngorms, Nevis Range, Torridon and the Cuillins of Skye, with portraits of the mountains and the panoramas seen from them. The seasons and moods of these landscapes are revealed, with many images that capture the extreme snows of recent winters. This new edition is greatly expanded with an extra 32 pages and a total of 109 pictures, 73 of which are new to this edition.